Fellow Michigan Boston Whaler owner (21 Walk-Around) Jeff Angeleri (aka ledfoot) wisely spent some recent vacation time in the sunny and warm climate of southern Florida and contributed a series of fine digital images of several new or recent Boston Whaler boats, including the 2002 255 CONQUEST model which he happened to come across in his travels. The "all-new" 255 CONQUEST represents a giant departure from previous Whaler styling. 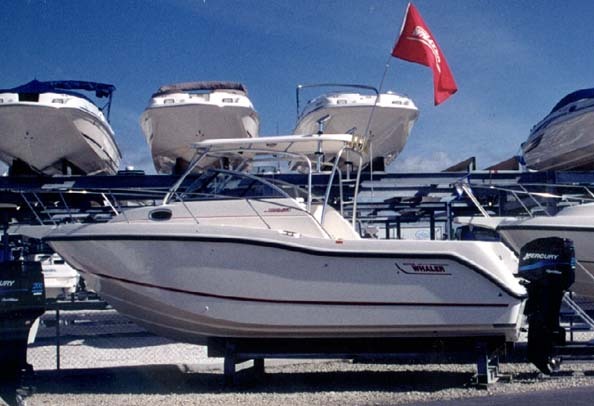 Through the years, through the owners, and through the designers there had been one fairly constant element of the Boston Whaler boat hull, its sheer line. You could change the dead rise, you could change the bow entry, you could move the chines, and you could eliminate the smirk, but a "Whaler" always had a straight sheer line. When a "Euro" transom was grafted on that modified the sheer in the extreme stern, but for most of the boat it still ran straight. The 255 CONQUEST model puts that tradition to rest. 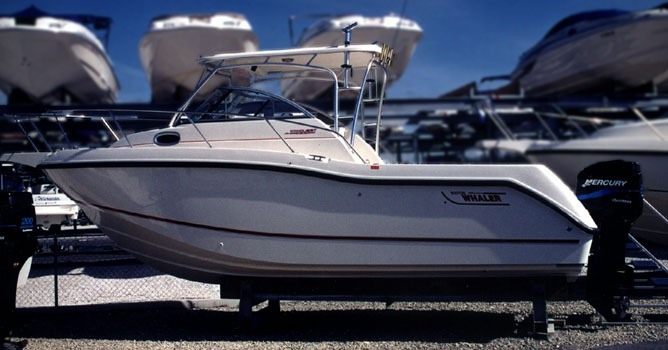 Boldly going where SeaSwirl, Scout, and many others had gone before, Whaler introduces the reverse-curving sheer on the 255 CONQUEST. Jeff, who happens to design General Motors vehicles for a living, describes it as "derivative" and finds the forward half reminiscent of "a Grady-White bow." The new boat certainly has a significantly different appearance than its predecessors. In the past Whaler designs have tried to preserve their characteristic low freeboard and straight sheer that sloped gently down from the bow to the stern by using the prominent line of the rub rail to dominate over the actual sheer line. The rub rail is placed on the hull so it slopes down slightly to the stern, even if the actual sheer line of the boat does not. And the rub rail is often placed several inches below the actual sheer line, drawing the eye away from the added height of the gunwales. This trompe l'oeil allows the boat to have the appearance of lower freeboard than it actually does, and it maintains a brand style or look consistent with the previous boats. The designers of the 255 CONQUEST have done a nice job in drawing the lines of this curving sheer. It is not an ugly boat, but it is just a boat that does not look like a Whaler. The new 2002 255 Conquest model from Boston Whaler introduces a drastic change in the style of the legendary hull: the straight sheer line has been abandoned. In its place a triple reversing curve more the trademark of a SEASWIRL than a WHALER. That red stripe in the hull appears to be just an accent line, perhaps placed to suggest the older hull style where a small chine was often molded in about that same location. Note how the rub rail line varies from the actual sheer line profile. It will be interesting to see how all these curves fit together when the hull is floating on its waterlines. The stern appears to have pockets molded into transom for mounting trim tabs. The transom can handle twin engines. The beam is 102-inches, still trailerable without special permits. Behind the motor to starboard is a transom gate for easy boarding. The dealer (Gulfwind Marine) has the new boat flying a red WHALER flag to help identify the brand. The 225-HP Optimax on the transom is not a small engine, but here it looks rather petite. This is a good indication of the size of this boat. While "snooping around" Sarasota in "mediocre weather", Jeff also found this recent 28-foot Outrage Accutrack hull, which he felt "is pretty industrial looking." In contrast to the curvy Conquest lines, this boat does look positively Neo-classic! With 450 horsepower on the transom, this big Whaler 28-foot Outrage suggests "industrial strength." In the background, note the elliptical windows on the SeaRay, where they belong. The business end of the 28-Outrage Accutrack hull. The hull mold provides pockets for trim tabs. Finally, a true classic, the 25-foot Bob Dougherty hull in the Frontier trim, in service as a Rescue boat for Sarasota County (Florida). 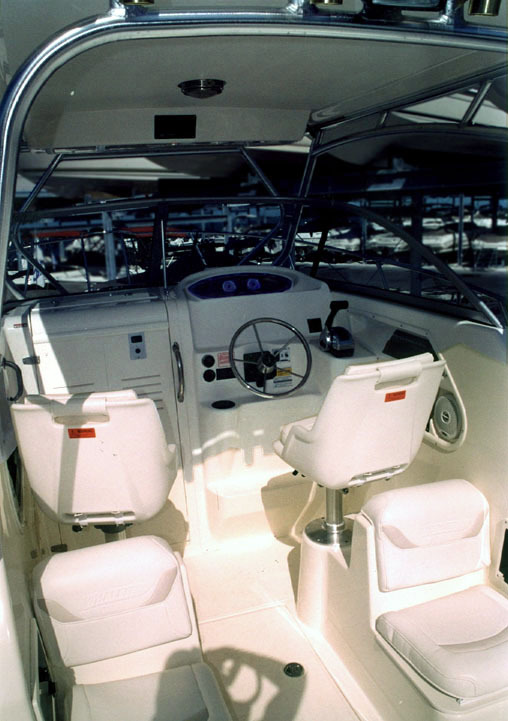 Here you can see the straight sheer line and low freeboard that we've been talking about as emblematic of the "classic" boats of the Boston Whaler company. After all those curving sheer lines and high freeboard, it is refreshing to see the classic Whaler profile in this 25-foot hull. 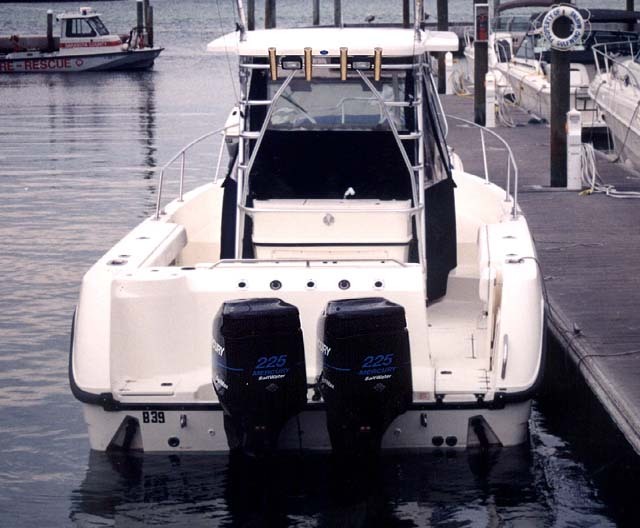 With a Whaler Drive, large twin outboards, dive tanks, and a large pump, this boat is heavily loaded and floats a bit low on her lines. Jeff and Rosie Angeleri have a 21 Walk-Around, a boat similar to the 255 CONQUEST in that they are both trailerable cuddy cabins. The 21 Walk-Around was a styling innovation in its time, too. 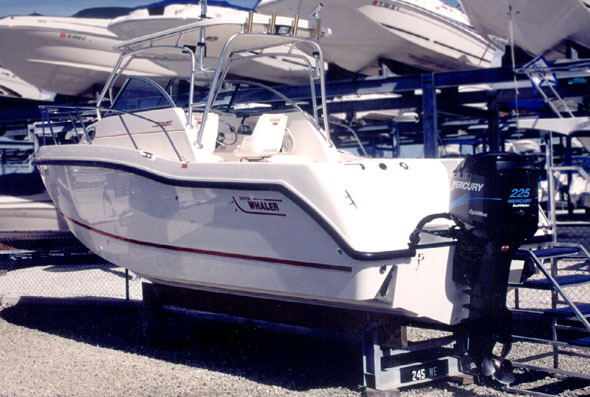 Produced after the sale of Whaler to Reebok, the boat had a new hull design and a very gently upward curving sheer. 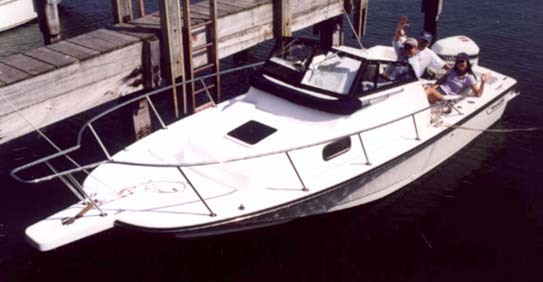 Here is Jeff's boat, a 1992 21 Walk-Around. Upon its introduction in the early 1990's this design was seen as a radical departure from the Whaler look. Rosie waves hello from the cockpit. Here is another look at the lines of the 21 Walk Around. Some of the best fun in boating comes with being able to trailer a boat that has accommodations for over-nighting. Jeff's 21 Walk-Around is on a new AMERICAN-brand bunk trailer, hooked to a nice new GM Truck. By the way, the last time I saw that truck Jeff had stripped it to the chassis and was rebuilding the entire rear end with a custom air ride suspension--these auto guys! As always, there is a FORUM section for follow-up comments on these Cetacea photographs. Please feel free to join the discussion. The page has been accessed 71158 times. This article first appeared January 19, 2002. Photo 49-01 was replaced with a higher quality JPEG file of the same image on January 24, 2002.